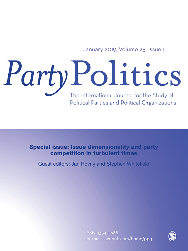 “Issue dimensionality and party competition in turbulent times” from Party Politics, Jan Rovny, Stephen Whitefield, January 2019, vol 25, n° 1. 93 p.
We start from the premise that the content of political competition is regularly remade by shifting contexts and by the strategic activity of political actors including parties. But while there are naturally thousands of potential issues on which politics can be contested, there are in practice and for good reasons ways in which structure and limits come to reduce the competition to more cognitively manageable and regularized divisions—in short, to issue dimensions. It is highly timely to return to these questions since, we argue, the social, political, and economic turbulence of recent years raises the possibility that the ideological structure of how parties present themselves to voters may be radically shifting. The papers in this special issue, therefore, each tackle an important aspect of the shifting character of the issues that underlie party competition in various European settings. In this article, we provide an overview of the relevant “state of the art” on issue dimensionality and how the subject is situated within the broad framework of understanding party competition.